The experience of Vedanta is possible only for those who have completely given up all desires. For the desirous it is far away, and they should therefore try to rid themselves of all other desires by the desire for God, who is free from desires. Verse B13  also asserts this same point. Attending to Self is devotion to the supreme Lord, because the Lord exists as Self. The Wise, who know that all worldly experiences are formed by prarabdha alone, never worry about their life’s requirements. Know that all one’s requirements will be thrust upon one by prarabdha, whether one wills them or not. Bhagavan said, “That which is present at all times is sakshath (manifest). The person ‘I’ is always present (sakshath). Then what is karam? That which is the cause is karam, so sakshatkaram (manifestation) means the knowledge of that which is true, that which is permanent and that which is the cause of everything is one’s own Self. And they say that God will descend from somewhere and manifest Himself if the Self which is ever existing, creates a shape according to its own desires, and meditates on it. You give up the Self which is existing at all times and at all places, and do sadhana with the hope that some God from somewhere will manifest Himself. They say that God just descends and again just disappears. You give up the Self which is always existent and strive for this transient vision, obtain boons and thus multiply the mental struggles and strivings. 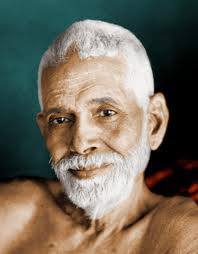 There will be no trouble at all if one simply remains as one is,” said Bhagavan. Bhagavan: “When some devotees sang in terms of Advaita, some commentators twisted the meaning, interpreting it in terms of Visishtadvaita. That is all; it is nothing else. That is also the opinion of all the ancients. After all, what exactly is meant by Visishtadvaita? That which is Visishta (distinguished) and best is Vishnu. That is Ishwara, Sadasiva, Brahma and all. That which is, is only One. Some Vaishnavaites give it a name and a shape and do not admit that there could be any Sayujyam (absorption in the Supreme Being) except by way of living in the same world (Salokyam), in the same vicinity (Sameepyam), and the same form (Sarupyam) as the Supreme Being. They say, arpana, arpana (offering, offering). How can there be arpana unless there is a thing called ‘I’? Complete surrender cannot come about unless one knows who one is. It is mere delusion to think of arpana (offering), so lightly. Arpana means that the mind gets merged in the self and becomes one with it. It means that it should become devoid of all vasanas. And that will not come about unless there is self effort and God’s Grace. God’s force cannot get hold of you and drag you into itself unless you surrender completely. But where is the question of our surrendering? The self itself is to be surrendered. Until one can accomplish that, one should go on struggling unceasingly. It is only after trying again and again that one may, finally, succeed in the effort. Once you succeed, there is no going back. That is the proper course. What is the use of merely repeating the word arpana, arpana? Except that you give some money while repeating the word arpana, what is the effect on the mind? In this Thiruvaimozhi itself there are some songs in the Advaitic cult sung by some devotees after attaining Self-realisation. Nammalwar is one such devotee. He sang that a mother praised her daughter who attained Self-realisation in a form that looked like condemnation. The gist of those songs is, ‘This child says, I am Siva, I am Vishnu, I am Brahma, I am Indra, I am the sun, I am the five elements and I am everything! It is that Vishnu who sits on her head and makes her talk thus; otherwise she would not have these aberrations. It is that Vishnu who has changed her thus.’ That is the purport of these songs.” Those songs were read out and Bhagavan explained the meaning. Siva shines within each jiva as the witness, enabling the jiva to experience his prarabdha through Siva’s presence. Whoever knows his nature to be mere being-consciousness, without imagining through ignorance that he is the experiencer of prarabdha, shines as that supreme person, Siva himself. Siva here denotes Iswara, the personal God, not Sivam, the impersonal absolute consciousness. When he spoke about prarabdha, Bhagavan generally adopted the position that God, Iswara, gave each jiva its prarabdha and also ordained that each jiva must experience the fruits of its actions so long as it identified with the body that was performing the ordained activities. Who am I? How is it to be found? M.: Ask yourself the question. The body (annamaya kosa) and its functions are not ‘I’. Going deeper, the mind (manomaya kosa) and its functions are not ‘I’. The next step takes on to the question. “Wherefrom do these thoughts arise?” The thoughts are spontaneous, superficial or analytical. They operate in intellect. Then, who is aware of them? The existence of thoughts, their clear conceptions and their operations become evident to the individual. The analysis leads to the conclusion that the individuality of the person is operative as the perceiver of the existence of thoughts and of their sequence. This individuality is the ego, or as people say ‘I’. Vijnanamaya kosa (intellect) is only the sheath of ‘I’ and not the ‘I’ itself. Enquiring further the questions arise, “Who is this ‘I’? Wherefrom does it come?” ‘I’ was not aware in sleep. Simultaneously with its rise sleep changes to dream or wakefulness. But I am not concerned with dream just now. Who am I now, in the wakeful state? If I originated from sleep, then the ‘I’ was covered up with ignorance. Such an ignorant ‘I’ cannot be what the scriptures say or the wise ones affirm. ‘I’ am beyond even ‘Sleep’; ‘I’ must be now and here and what I was all along in sleep and dreams also, without the qualities of such states. ‘I’ must therefore be the unqualified substratum underlying these three states (anandamaya kosa transcended). D: How does book-lore help in Self-Realisation? A.: Only so far as to make one spiritually-minded. D.: How far does intellect help? A.: Only so far as to make one sink the intellect in the ego, and the ego in the Self. M.: Who is a Master? He is the Self after all. According to the stages of the development of the mind the Self manifests as the Master externally. The famous ancient saint Avadhuta said that he had more than 24 Masters. The Master is one from whom one learns anything. The Guru may be sometimes inanimate also, as in the case of Avadhuta. God, Guru and the Self are identical. A spiritual-minded man thinks that God is all-pervading and takes God for his Guru. Later, God brings him in contact with a personal Guru and the man recognises him as all in all. Lastly the same man is made by the grace of the Master to feel that his Self is the Reality and nothing else. Thus he finds that the Self is the Master. M: Which is the real power? Is it to increase prosperity or bring about peace? That which results in peace is the highest perfection (siddhi). D.: But common people in Europe and America would not appreciate such an attitude and would desire a display of powers and instructions by lectures, etc. M.: Lectures may entertain individuals for a few hours without improving them. Silence on the other hand is permanent and benefits the whole of humanity. D.: But silence is not understood. M.: It does not matter. By silence, eloquence is meant. Oral lectures are not so eloquent as silence. Silence is unceasing eloquence. The Primal Master, Dakshinamurti, is the ideal. He taught his rishi disciples by silence. D.: But then there were disciples for Him. It was all right. Now it is different. They must be sought after and helped. M.: That is a sign of ignorance. The power which created you has created the world. If it can take care of you, it can similarly take care of the world also.